Footprint360 is a specialty family footwear retailer. In short, it is a complete footwear provider for the whole family. Reliance Footprint is known for its quality and its huge range of footwear. What you can expect from Reliance Footprint? Here is the list that includes footwear for men, women and kids, handbags, luggage, socks, belts and much more. It offers footwear and accessories for every occasion like indoor, formals, sports, parties, outdoor, occasional or anything. It understand the needs of all ages and cater them with the best footwear. For the best customer service, quality and shopping experience always visit this cool site and also use Footprint360 coupons for best offers. Shop and get upto 50% off on formal shoes online at Footprint360. Choose from various branded shoes like Alberto Torresi, Allen Solly, Buckaroo, Craft, Egoss, Hi - Attitude, Lee Cooper, Red Chief and more. No discount coupons required to get this exclusive offer. Shop and get now! 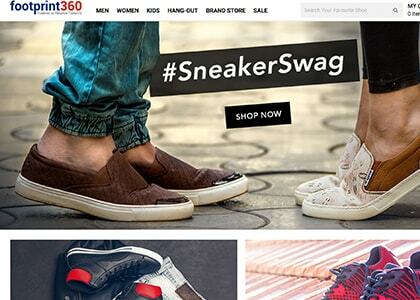 Shop and get flat 30% off on Sneakers online at Footprint360. Here you can get sneakers for men, women and kids. No coupon codes required to get this discount offer. Shop from massive collection and place your orders now! Shop and get flat 30% off on Puma footwear online at Footprint360. Choose from lifestyle shoes, running shoes, sandals, slippers and more. No promo codes required to get this exclusive offer on Puma. Place your orders now! Get flat Rs 600 off on a minimum purchase of Rs 3500. Applicable on Puma footwear only. Apply coupon code at check out page to get discount. Get flat Rs 800 off on a minimum purchase of Rs 4500. Applicable on Puma footwear only. Apply coupon code at check out page to get discount. Place your orders now! Footprint360 offers upto 50% off on all merchandise online. Choose from massive collection of footwear on the site and make avail of this exclusive offer. No discount coupons required to get this discount offer. Applicable for all users. Hurry up and make avail of this exciting deal. Verified on 23/4/2019 . Footprint360 offering the end of season sale. Make the most of the sale with up to 60% discount on men's and women's footwear collection. Choose from different styles, designs, colors and brands which are listed on the landing page. No Footprint360 coupon code is required. Shop and avail buy 1 get 1 offer on shoes online at Footprint360. Choose from boat shoes, boots, brogues, casual shoes, derby shoes, formal shoes, loafers and more. Apply coupon on your checkout page to get this BOGO offer. No other codes can be combined with this offer. Shop and place your orders now! Shop for men's footwear online at Footprint360 and get exciting deals. Here buy 2 and get flat 50% off. Choose from massive collection of lifestyle shoes, running shoes, sandals, slip on shoes, slippers and more. Apply coupon on your checkout page to get this offer. No other codes can be clubbed with this deal. Hurry up and get now! Casual or ethnic no attire is complete without befitting footwear! The new age, fashion conscious men and women of today, wants to pair up their dresses for casual outings as well as office in a way that it matches the dress combination and also ups their glamour and style quotient. This is where you can make the most of the online world and its umpteen shopping scopes to have access to footwear deals that help you bag the best products within a great price rate. This is where you can make the most of the footprint 360 coupons that are provided on HappySale. Here you will have access to footwear from a wide range of brands in the best possible style and at the best price deal as well. So keep browsing and get your choicest deals. Best known as a family footwear retailer, this online brand provides you with a wholesome range to browse and select from! You can make the most of the footprint 360 promo codes and have access to the best of the deals and discounts that are available on the kid’s shoe section. That isn’t all. You also have the chance to make the most of offerings from some of the best brands such as Puma that allows you to get discount of Rs.600 when you make a purchase of Rs.3000 or above. In order to woo more and more customers, this brand also has come up with buy 1 get 1 free offers and the like. If you are a style conscious man and love to select your footwear carefully then browse through the deals available on the men’s footwear section and get the best discounts possible. Choose from the promotional deals and the cash back deals as well. If you want to make the most of the footprint 360 coupon codes you can book the best deals from HappySale as this website is all about authentic deals and latest offers that help you save a good deal.